The sizing was correct; but on me, the bodice was too short from shoulder to just below the bust line - too tight under the arms and vest cut too much across bust. Great custome. Fit well. It's one piece which is nice when getting ready. It also washed up nicely so I can wear it again. Loved this costume! It was a big hit in my office! ?? Loved this costume. Came just as expected and fit me perfectly (ordered a small) would recommend except it smelled kind of terrible, like chemicals or something. Other than that it was perfect. This is the cutest costume!! Absolutely love it. It was very wrinkled but a few minutes in the dryer with a wet washcloth and they were gone. I am 5'6" and 150 pounds and the large fit perfect. 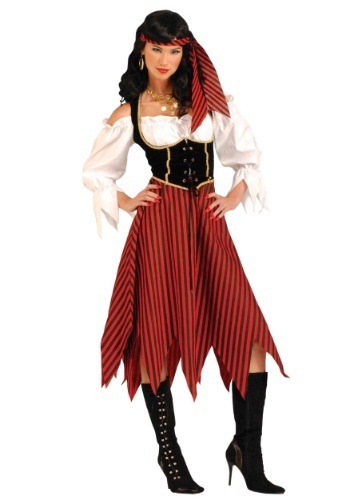 Going to pirates weekend in the 1000 islands and this is gonna look great!! Fit my wife very nice. She even liked it (from someone who doesn't like to step out of her box).